Good news and bad news. 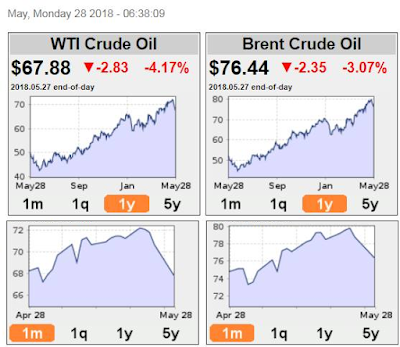 The good news is that world oil prices are declining in recent days, WTI for instance fell from $72 last week to only $67+ yesterday, so we can expect lower domestic oil prices around next week. 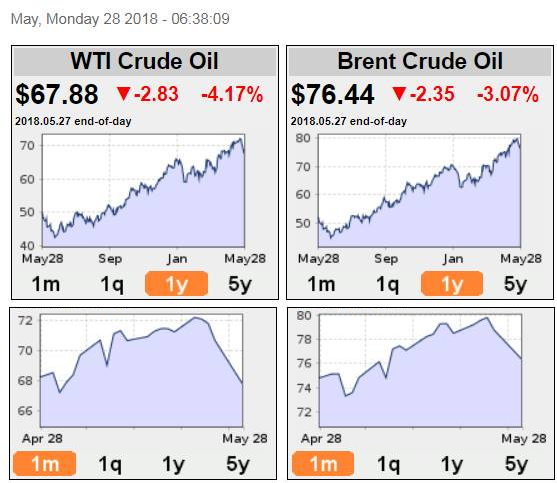 The bad news is that the $80/barrel Dubai crude threshold may not be reached anymore, so oil tax hikes part 2 by January 2019 under TRAIN will continue, another round of oil price hikes. Either way, there will be more tax money for Dutertenomics. Higher world oil prices mean higher domestic prices, higher VAT collections. Lower world oil prices means the $80 threshold won't be reached, so part 2 of oil tax hike will proceed by January 2019. Whether higher VAT collections or higher excise tax collections from oil products, more money and jumping with joy for Dutertenomics. Two main reasons for this. One, US oil production is ramping up fast, 10-11 M barrels per day (mbpd) seems easy. Hitting 12 mbpd may be reached this year or next year. Two, Saudi and Russia are scared of losing some of their market share if they continue the production cut, so they too have to raise their output. High oil prices can "kill cars" dream of the ecological socialists? Far out. That would mean more motorcycles, more tricycles, more e-bikes and more chaos on the roads. And that won't happen. People would cut their spending on expensive schools and meals, expensive houses, etc but they won't let go of their cars. The multiple ride system if one does not have a car, either owned or via ride-sharing/TNVS, is inconvenient. It means tricycle from house to nearest road with jeepney or bus, then jeep/bus, then MRT/LRT, then jeep again to destination. Reverse the process going home, about 6-8 rides a day. Inconvenience, susceptibility to thieves and maniacs.